Tiger Woods really needs his wife. And his A game. That's the opinion of experts in the art of getting people through media crises like the one the golf champ faces after his single-car crash led to a multiwoman pileup of infidelity allegations. If Woods can persuade his wife Elin Nordegren not only to stick by him, but also to say in the presence of a large media outlet or two that she has forgiven her imperfect husband and that everyone else should feel free to do likewise, then resurrecting his image is easier than nine holes of putt-putt. Her being in the room while he makes a statement of contrition (see playbooks by Spitzer, Silda, or Bryant, Vanessa) is a close second. The quicker this can be done, the better. Woods is uniquely ill suited to being the center of a tabloid whirlwind. He's excruciatingly private, he plays in a conservative, country-club sport, and he and his team have cultivated a personal brand that represents control, discipline and a hair-away-from-perfection. Allegations of numerous mistresses, Las Vegas romps, audio purportedly of his asking a woman to disengage the caller-ID feature from her phone so his wife wouldn't see it, plus a final, belated admission that "I have let my family down," do not gel well with this image. "What Tiger and his advisers have managed to do so far is make this a much bigger story," says Michael Sitrick, CEO of the crisis-management firm Sitrick & Co. "There's this mind-set that if you hunker down and take the 'high road,' it will go away." The publicist points to Bill and Hillary Clinton as exemplars of the "wife first" approach: once Hillary said it was between Bill and her, the heat went down. "If he can get his wife to support him, I'd pick one print and one broadcast outlet and then never talk about it again." But Woods is equally ill suited to the kind of kimono-opening demanded by this approach. He has always been prickly with the press about his personal life. So his statements have trickled out piecemeal  the worst way. "I don't see him going Oprah," says Kevin Sullivan, a former White House communications director who now runs his own p.r. firm. "And I don't think he should provide any details of what went on." Woods may not have much choice since his alleged mistresses are reported to have text messages from him and to be willing to share them (at a price, presumably). Also, given the public nature of golf, with the crowds and press able to get close to the players on the course, it's unlikely he can hide completely unless he never plays again. 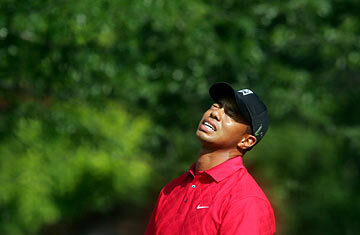 Click to hear an alleged voice mail from Tiger Woods to a woman who is reported to be one of his mistresses. One thing on which all the p.r. and sports-marketing experts agree on is that he should play as soon as possible. "He has the huge advantage of still playing really well," says Sullivan. "Americans are very forgiving, and sports fans especially so, and as soon as he starts playing again, he should be fine." Much of Woods' reported billion-dollar wealth has come from endorsements  Gatorade, Nike and Electronic Arts, among others  and it is these deals that are usually most damaged by crises. But as long as Woods still sinks the ball, big companies will want to walk in his spikes. Nike and Gatorade have already released statements of support. They are too heavily invested in him to cut him loose. "There's some kind of calculus here," says Kenneth Shropshire, a professor of sports management at the Wharton School of Business. "You have to factor in the degree of the wrong, how quickly the apology was made and how many people were hurt." Against that, you have Woods' freakish ability. "If he's going out and playing at a high level, that has proved itself to be the best way to move beyond these incidents." Read "Looking for Reasons to Care About Tiger Woods." See People.com: "Tiger Woods Apologizes for His 'Sins.' "